A few decades ago, Native American artistry consisted of little more than dusty pots in trading posts and Jay Silverheels on the silver screen. Native artists have come far since then. They're now creating vibrant work in every field from sculpture to ballet to comic books. At the movies, 2002 has been a banner year for Indians. Native-themed movies include "The Business of Fancydancing," "Skins," "Windtalkers," "Spirit: Stallion of the Cimarron," "The Fast Runner (Atanarjuat)," the unreleased "Christmas in the Clouds," and the part-Native "Brotherhood of the Wolf" and "Wendigo." Most movies use Native actors to play Native roles these days, but "Fancydancing," "Skins," "Fast Runner," and "Christmas" had wholly or predominantly Native casts. More important, Indians wrote, directed, or produced these features. As Sheila Tousey, who co-produced and co-starred in "Christmas," has said, "Hollywood expects leather and feathers or some serious drama that usually involves dysfunctional behavior." She found it "refreshing to play something fun and light" in "Christmas," a romantic comedy whose only drinker is a white guy. 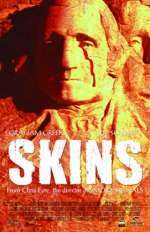 "It's not about romanticizing who we were," director Chris Eyre has said of his "Skins," the story of two Lakota brothers. "It's about looking at who we are." Beyond the big-time productions, Native people are making videos and documentaries, such as Mark Anthony Rolo's survey of urban Indians in Southern California. They're showing their work at such venues as Imagenation, the First Peoples' Festival, and the Native American Film and Television Alliance. Television hasn't done as well since "Northern Exposure" and "Dr. Quinn, Medicine Woman" went off the air. Organizations that monitor TV diversity have given the networks failing grades for their dearth of minorities. For instance, Children Now's third annual report, "Fall Colors 2001-02," found that network TV largely ignores Natives and ignores Native women completely. But Indians are starting to come back on the tube as well. Actor Graham Greene played a key role in the series "Wolf Lake" (2001-2002). Indians have figured prominently in episodes of "The West Wing," "Malcolm in the Middle," and "The Sopranos." PBS has premiered "Skinwalkers," a Tony Hillerman mystery, and ABC is planning "Dreamkeeper," a myth-based mini-series. Even better, Indians and non-Indians alike are working to fill the Hollywood pipeline with Native talent. For the second year in a row, the Oneida Nation has held a nationwide search for the next generation of Native performers. 20th Century Fox is sponsoring a diversity outreach program to introduce aspiring young Indians to show biz. In music, such traditional performers as R. Carlos Nakai continue to win awards for their flute playing. But now the field encompasses everything from Keith Secola's rock anthem "NDN Kars" to Casper's reggae-style rapping to Todd Tamanend Clark's industrial metal sound. Native music has blossomed so much that it received its own Grammy category in 2001. The theater has moved beyond such standard dramas as "Black Elk Speaks." Organizations like the Autry Museum in Los Angeles are staging new and established works by Native playwrights. The Autry's Native Voices program has helped develop such plays as "Jump Kiss" by Diane Glancy, "Seagulls" by Greg Sarris, and "Please Do Not Touch the Indians" by Joseph Dandurand. In literature, Native authors like N. Scott Momaday, Leslie Marmon Silko, and Louise Erdrich are showing up on bestsellers' lists. Velma Wallis, a member of the Gwich'in Tribe, is reportedly Alaska's most popular living author. She's sold more than a million copies of her book "Two Old Women." The classic Native arts—painting, carving, pottery, jewelry, weaving—continue to flourish. They've become a billion-dollar industry, with intertribal marketplaces held annually in many cities. They influence the aesthetics throughout the West, especially in places like Santa Fe and Seattle. Museums are presenting such exhibits as "Looking at America: Modernity of Indigenous Cultures," "Spirit Capture: Native Americans and the Photographic Image," and "KATSINA/kachina: Tradition, Appropriation, Innovation." These shows demonstrate the ongoing exchange between Native and non-Native cultures. One highlight of the Native art scene will be the opening of the National Museum of the American Indian in 2004. The NMAI will complete the complex of Smithsonian museums on the National Mall. For the first time, as director W. Richard West has said, "Native peoples are telling their own stories and participating collaboratively with a national museum of Native history and culture." It's quite a turnaround from the time when government agents, anthropologists, and art collectors took Native people's objets d'art while trying to terminate their cultures and tribes. Clearly, Indian art and artists are here to stay. Rob Schmidt is a writer on Native and multicultural subjects for PECHANGA.net, the Internet source for Indian and gaming news. This article was written for a supplement to the San Diego Union-Tribune but not published because of space considerations.